The main objective of this work was to evaluate the effects of two machining processes on European oak wood surface characteristics. The relationships between wettability, free surface energy and machining methods were studied. Sawing and slicing, with or without sanding, were used to prepare surfaces prior to testing whether they produce surfaces with different characteristics. For the wood surfaces machined by slicing and sawing, there was a significant difference in contact angle measurements. This indicates that the influence of machining processes such as slicing and sawing on contact angle value is remarkable. Sanded surfaces showed good wettability and high process roughness. AGUILERA, A.; MUÑOZ, H. 2011. Rugosidad superficial y potencia de corte en el cepillado de Acacia melanoxylon y Sequoia sempervirens. Maderas-Cienc Tecnol 13 (1): 19-28. AGUILERA, A.; ZAMORA, R. 2009. Surface roughness in sapwood and heartwood of Blackwood (Acacia melanoxylon R. Br.) machined in 90-0 direction. European Journal of Wood Products 67: 297-301. AMORIM M. R. S.; RIBEIRO P. G.; MARTINS S. A.; DEL MENEZZI C. H. S.; SOUZA M. R. 2013. Surface Wettability and Roughness of 11 Amazonian Tropical Hardwoods. Floresta e Ambiente 20 (1): 99-109. ARNOLD M. 2010. Planing and Sanding of Wood Surfaces - Effects on Surface Properties and Coating Performance. In: Proceedings PRA's 7th International Woodcoatings Congress; Middlesex: Hampton. DE MEIJER M.; THURICH K.; MILITZ H. 1998. Comparative study on penetration characteristics of modern wood coatings. Wood Science and Technology 32 (5): 347-365. DIN 4768:1990. Determination of values of surface roughness parameters Ra. Rz, Rmax using electrical contact (stylus) instruments concepts and measuring conditions. GARNIER, G.; GLASSER, W. G. 1996. Measuring the surface energies of spherical cellulose beads by inverse gas chromatography. Polymers Engineering and Science 36 (6): 885-894. GINDL, M.; SINN, G.; REITERER, A.; TSCHEGG ,S. 2001. Wood Surface Energy and Time Dependence of Wettability:A Comparison of Different Wood Surfaces Using an Acid-BaseApproach. Holzforschung 55: 433–440. GINDL, W.; SCHOBERL, T.; JERONIMIDIS, G. 2004. The interphase in phenol-formaldehyde and polymeric methylene diphenyl-di-isocyanate glue lines in wood. 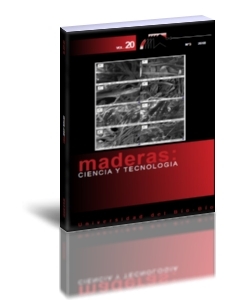 International Journal Adhesion Adhesives 24 (4): 279-286. KILIC, M.; HIZIROGLU, S.; BURDURLU, E. 2006. Effect of machining on surface roughness of wood. Building and Environment 41: 1074-1078. KWOK, D. Y.; NEUMANN, A. W. 2000. Contact angle measurements and contact angle interpretation: relevance to the thermodynamics of adhesion. In Acid-base interactions: relevance to adhesion science and technology, vol. II. Utrecht, Holland. Pp. 91–166. LEMASTER, R.; DORNFELD, D. 1982. Measurement of surface quality of sawn and planed surfaces with a laser. Paper presented in the Seventh Wood Machining Seminar. October 18– 20, University of California, Forest Products Laboratory, Richmond, CA, pp 54–61. LIPTÁKOVÁ, E.; KÚDELA, J. 1994. Analysis of the wood-wetting process. Holzforschung 48 (2): 139-144. MITCHELL, P.; LEMASTER, R. 2002. Investigation of machine parameters on the surface quality in routing soft maple. Forest Products Journal 52 (6): 85-90. PN-EN 1316-1:2013-04 Hardwood round timber. Qualitative classification. Oak and beech.